Sculpture and mural in Balboa Park Club’s grand foyer. – Beautiful Balboa Park! 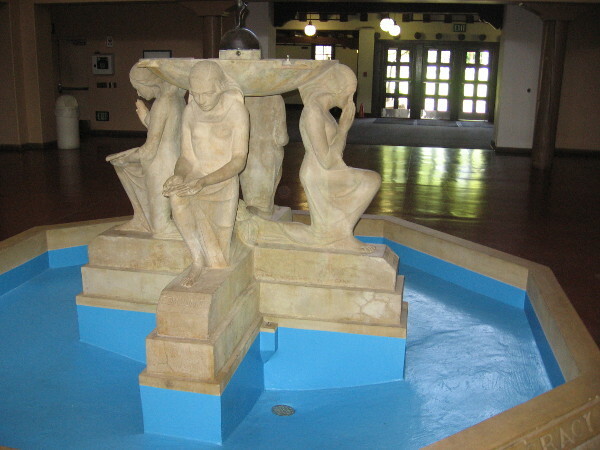 Sculpture and mural in Balboa Park Club’s grand foyer. A beautiful sculpture and large mural grace the grand foyer inside the Balboa Park Club. 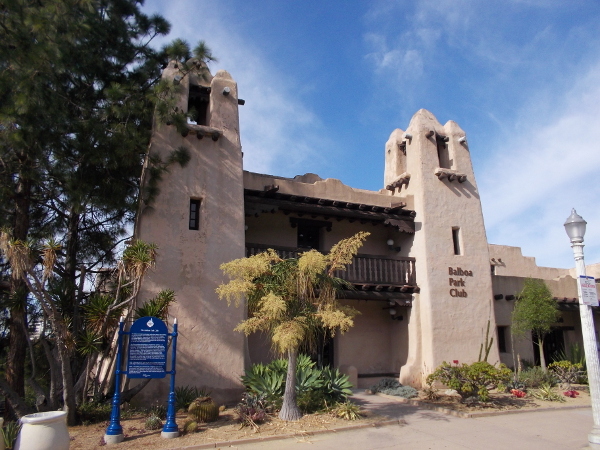 Lovers of art should step inside the Balboa Park Club when visiting Balboa Park. 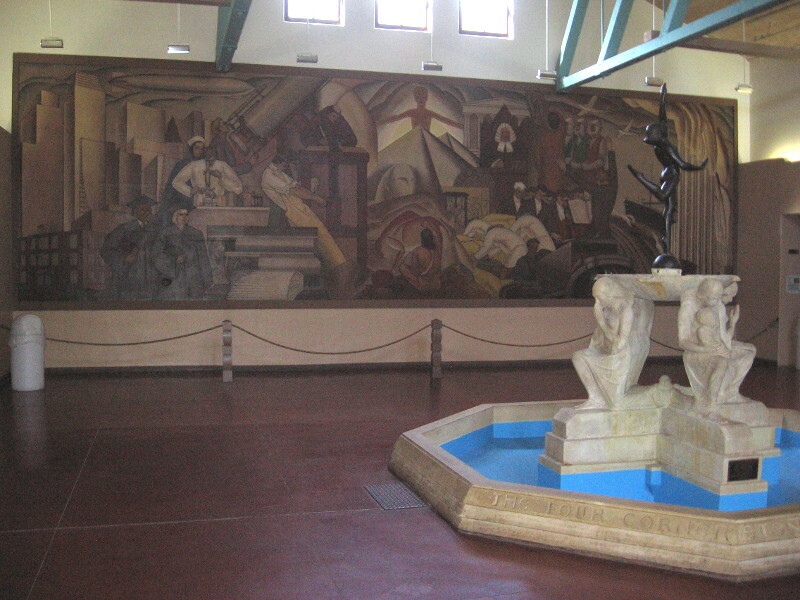 The historic building’s grand foyer is dominated by two monumental works of art: a sculpture titled Four Cornerstones of American Democracy by Frederick Schweigardt, and a mural titled The Progress of Man by painter Belle Baranceanu. 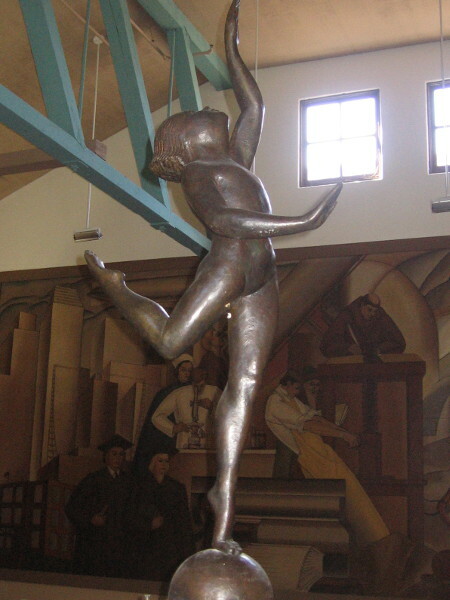 Both were created in 1935 for the California Pacific International Exposition. Here are some photos. Please read the captions for more detailed explanations. 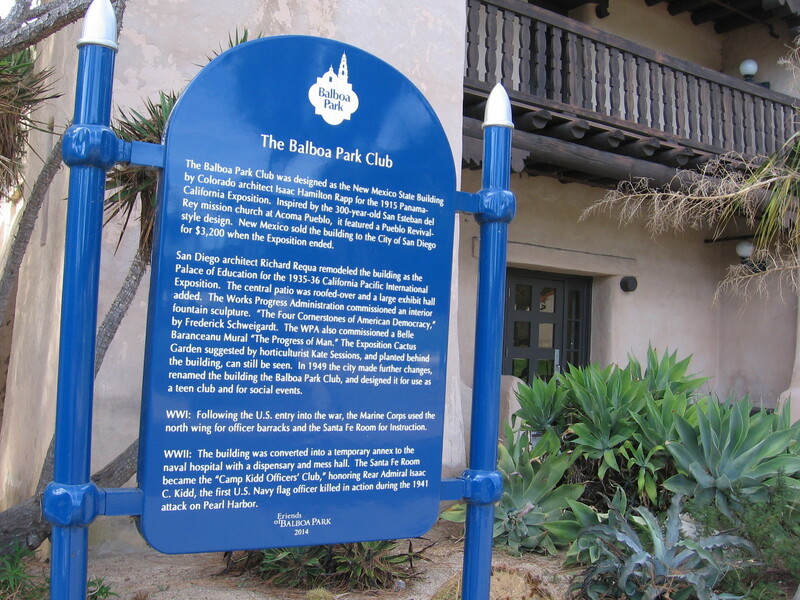 The Balboa Park Club is found directly west of the House of Pacific Relations International Cottages, in the area of Balboa Park called the Palisades. The handsome Balboa Park Club building in San Diego’s Balboa Park. 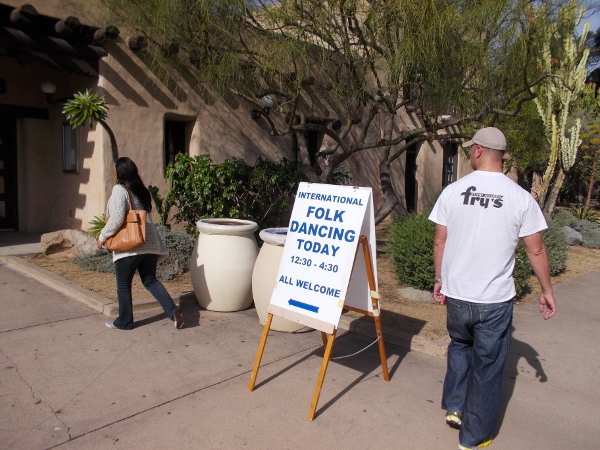 Folk dancing is a common activity in the large 13,000 square foot ballroom inside the Balboa Park Club. 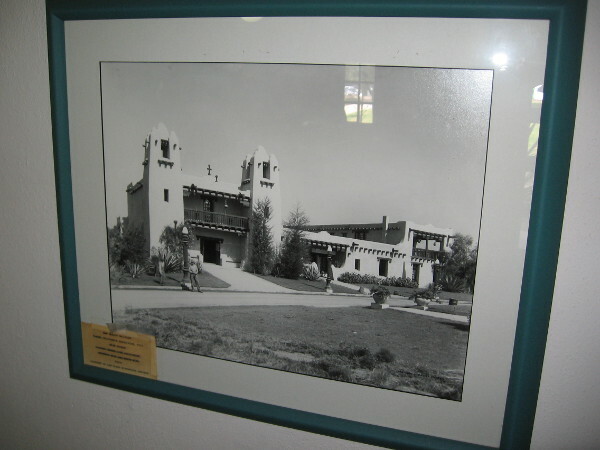 Photo just inside the entrance to the Balboa Park Club, looking left. 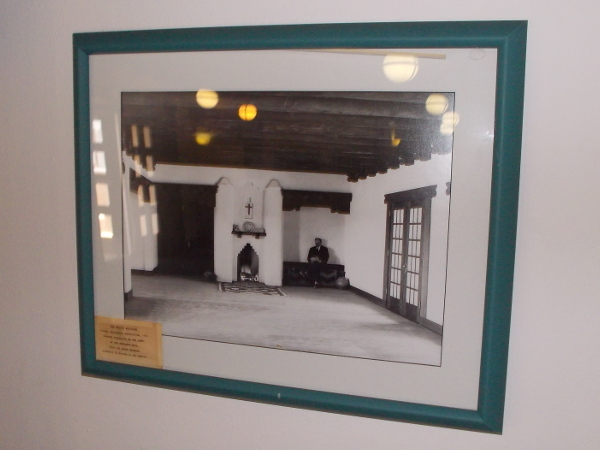 Old photo of same fireplace on the left of the building’s entrance hall, taken in 1915 during the Panama-California Exposition. 1915 photo of main facade of the New Mexico State Building during the Panama-California Exposition in Balboa Park. Inside the Balboa Park Club’s grand foyer, looking back toward the entrance. At the center stands the Four Cornerstones of American Democracy, a 1935 sculpture by Frederick Schweigardt. 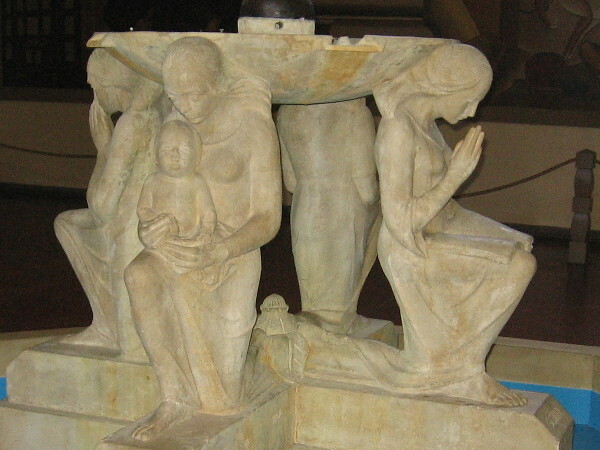 Frederick Schweigardt created the Four Cornerstones of American Democracy sculpture in 1935 for the California Pacific International Exposition. The building then was called the Palace of Education. Bronze dancer atop the Four Cornerstones of American Democracy sculpture. The cornerstones depicted are Home, School, Community and Church. 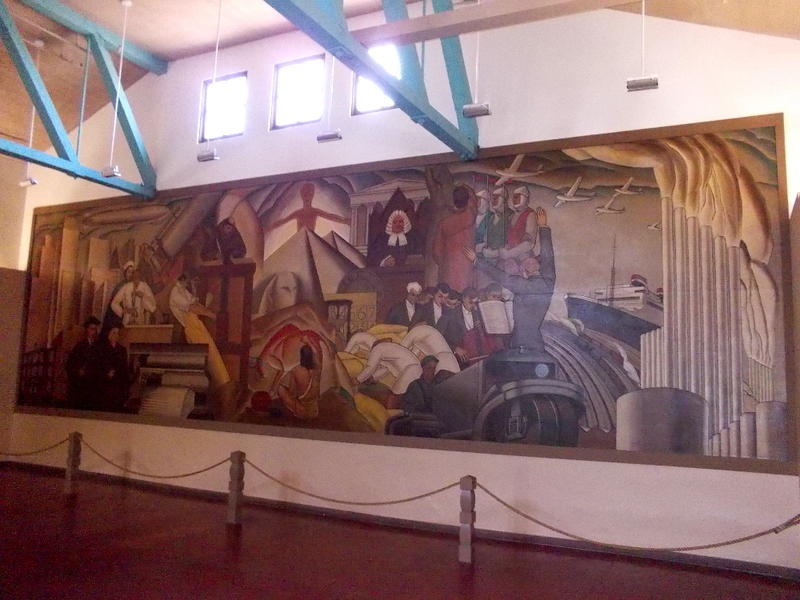 The Progress of Man, a large mural painted by Belle Baranceanu in 1935 for the California Pacific International Exposition. 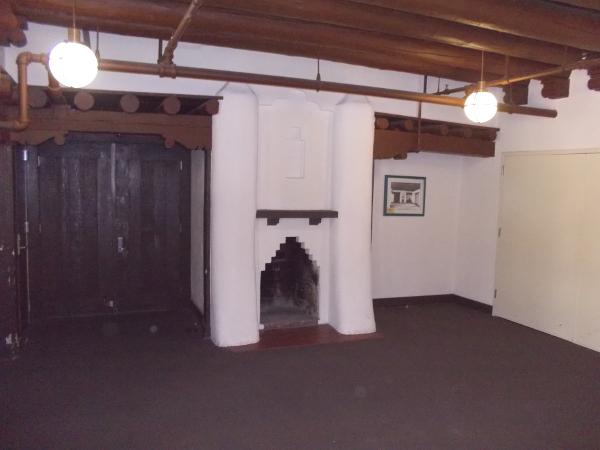 Step into the Balboa Park Club building to see it! 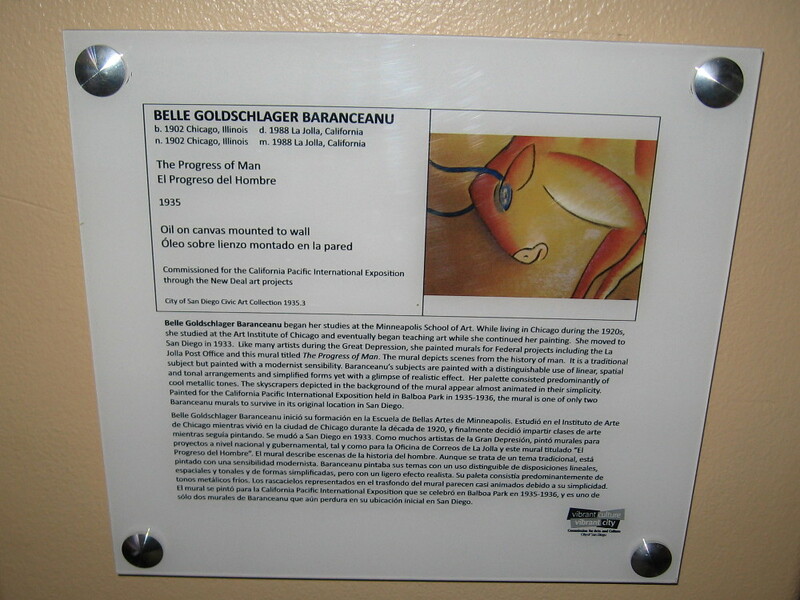 Belle Baranceanu created The Progress of Man mural in 1935. It is a traditional subject, painted with a modernist sensibility. She also painted a mural for the La Jolla Post Office. 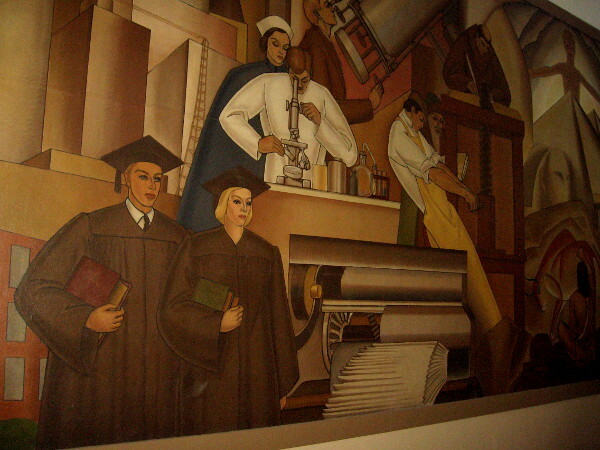 Education, medicine, science and printing are subjects included in The Progress of Man mural. 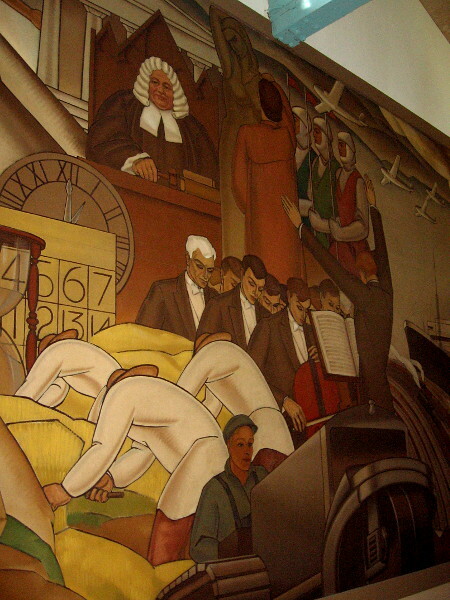 Another close look at The Progress of Man mural, which depicts technology and society in 1935. 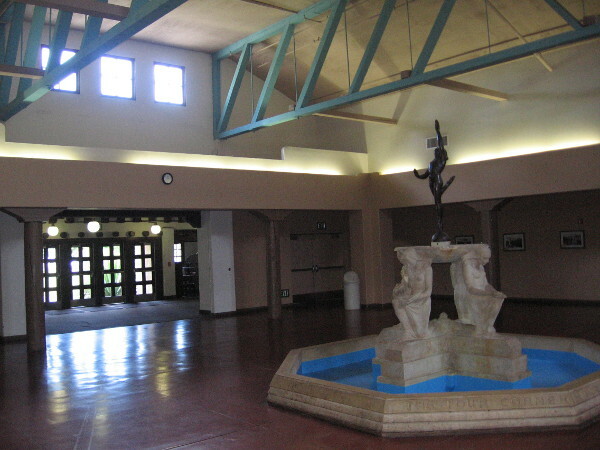 Two beautiful, historic works of art can be experienced in the Balboa Park Club’s grand foyer. Simply step inside! Pingback: Four beautiful sculpted faces in Balboa Park. – Cool San Diego Sights! Previous Previous post: Another picture perfect day in Balboa Park! Next Next post: San Diego Diwali Mela festival in Balboa Park.